She actually asked for, which is rare, Colborn Lane. I called ahead for a reservation because Open Table showed it booked for weeks. I thought it was odd and so I called in. It had closed that very night. *sigh* Back to the drawing board. I hit a bunch of review sites, since I feel less in tuned with the foodie scene in Toronto as I was in Vancouver. There, we knew who was cooking where and what was opening or currently a must eat. Here, I guess, we've been led by H who keeps us up on where she's eaten. She already has a running list for D for where to get a Medium Rare burger :). D and I did separate investigation and landed on Edulis. Nesltled in a small building in the unlikely Niagara neighbourhood, a couple of doors down from a Buddhist temple, Edulis is being touted as one of Canada's best restaurants. Run by a husband and wife team, given the modest location and size, are obviously still very invested in the daily success of the restaurant. I arrived early in some pretty nasty weather. I thought about walking around some more but it was so awful out and there really is NOTHING else in the area. I settled in with a nice glass of sparkling cider and looked over the menu. I was dismayed to find the one dish I had planned on ordering gone from the menu. I do that because, as my readers know, be rather fussy and didn't want to run into issues. D knows the drill. I pick my food in advance. I checked my phone to be sure and there it was, still on their daily menu. It was. *sigh* It was a Halibut dish on the Truffle menu. I double, triple checked with the staff but they confirmed they tend to update the menu daily and print out what's available that day. Normally Tobey, the owner, tries to make sure the menu on line is updated too. *sigh*. D and H arrived and ordered a nice Cava. They have an nice wine list with a good span of price and selection. They also have a nice array of by the Glass as well, which is great should you all be ordering different meats. As we studied our menus, we were unanimously confused as to where the starter and main line was drawn. What all of us had missed in our reading was that this was one of those Small Plates places...... *sigh*. Have you read my reviews of this ilk? like Cru, or Ensemble. I am not a big fan for mainly cosmetic reasons. See, when ranking the price of a place on most sites, they use the average price of a dish. But really, the price is deceiving because you actually have to order 2-3 plates to feel sated. Actually, even the staff always recommend you order at least 2-3. Often with 2-3 people, this covers the whole menu because there is normally only a 10 dish selection. Each individual small plate on the Edulis menu was approximately 20 dollars and the truffle menu averaged at about 50$/plate. I'm just being up front with potential guests so you are not surprised. Having been explained the menu, we were all at a loss what to order. I regretted the suspicion that D and H were worried there was not enough for me to eat and I had the worry that they wouldn't eat what they really wanted to eat. My eyes wandered over to the Chef's tasting menu. For 50 or 70$ you are in the hands of the Chef. Alas, it said it had to be the whole table. We asked what our options were because I do not eat meat.... nor really enjoy really gamey sauces, as she queried my boundaries :). I think they were a bit sympathetic because it was a Birthday dinner because they said it was fine. We ordered the smaller which was a 5 course meal where you leave your self in the hands of the Chef who promises to be 'nice' :^D. He was. It started a tad inauspiciously with Herring with Carrots in a L'Huile in Oil. I don't mind Herring. I prefer it more smoked, mind you. H hates Herring and D is not a big fan. As well, neither H nor I like things served in Oil. It came a large terrine filled to the brim with Oil. I find it aesthetically unpleasing. I held my carrots over the dish trying to drain as much Oil as possible. H tried some Herring but not much. D and I had most of it but I regretted it. It repeated. 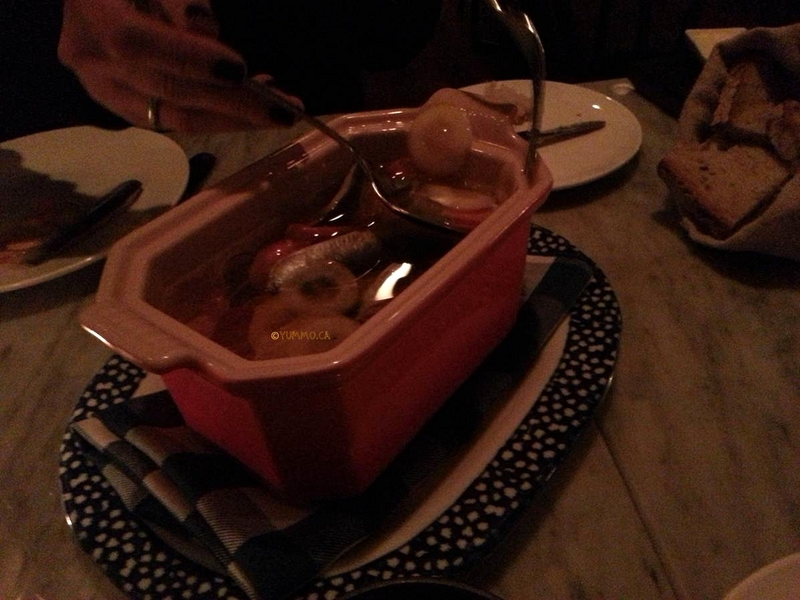 It was VERY VERY fishy exacerbated by the cold serving as well. The carrots were very nice but still very Oily. 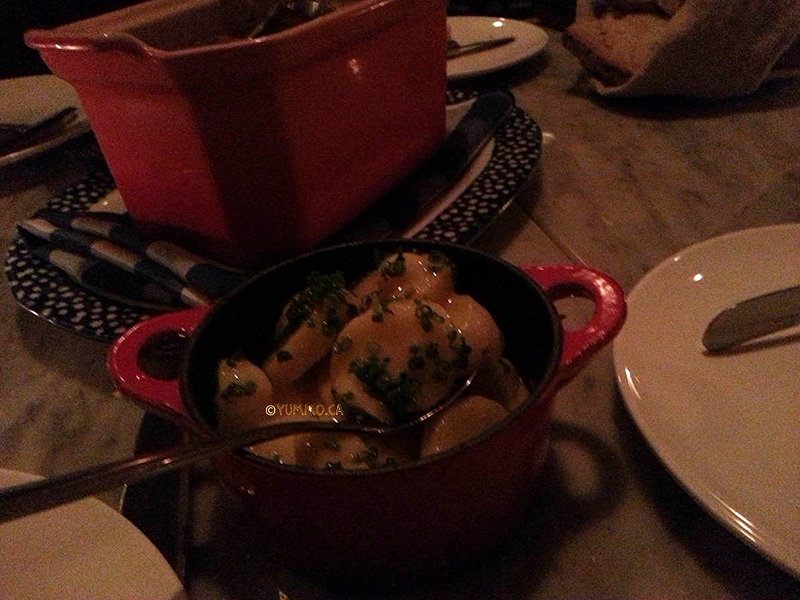 It was accompanied by a small side of warm German Potato Salad. It was very good. 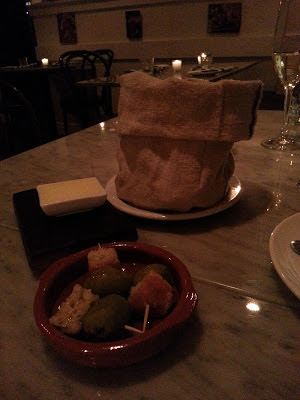 I sopped up the remaining creamy vinagrette with their chewy housemade bread. The Herring was to be on only disappointment, thankfully. Next time, I shall specify no Herring. The rest of our meal was STELLAR, though the pace slow but felt like the stress of the day was melting away as we sat chatting. Again, just informing you. I felt like I was back in Barcelona, in the early days when my friends told me going out for dinner isn't meant to be transactional. Waiting is part of the meal. It's time to talk and enjoy the evening. Our second dish was just amazing, one that H and I had looked at on the original menu. 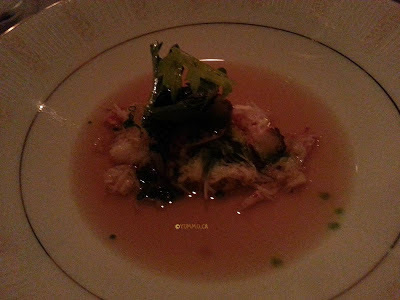 It was Charcoal Warmed Snowcrab with Berkshire Pork Cheeks with a Cap Mushroom Broth poured over. My serving came without the Pork. 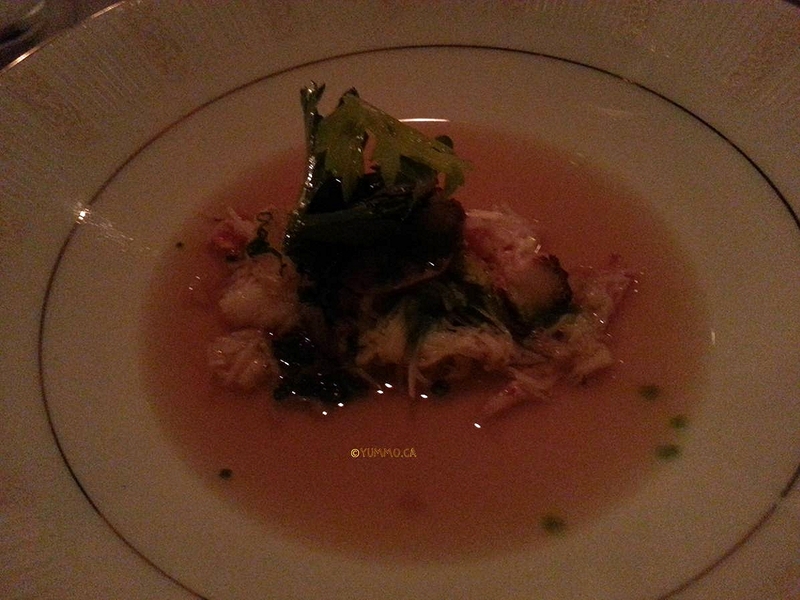 The Crab was delicately flavoured and the Broth just exploded with flavour. All three bowls were drained. D and H thought the combination of the Pork and Crab was lovely. Our third dish were completely separate. 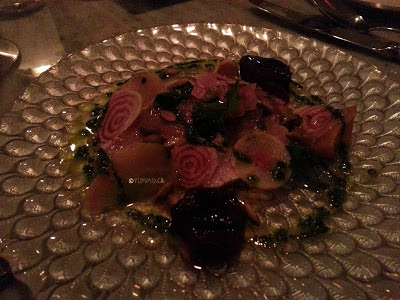 I had a salad of Seared Albacore Tuna with Beets 3 ways and Pumkin Seeds. 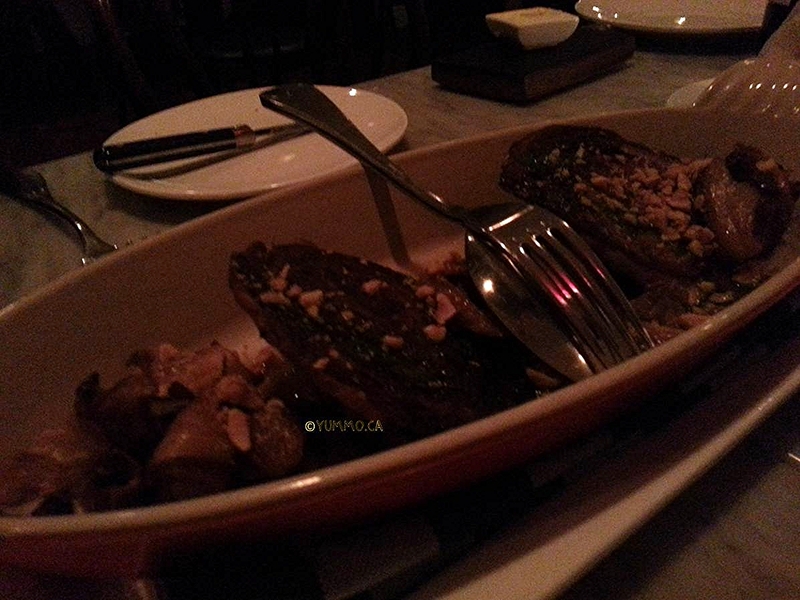 D and H had Veal and Sweet Breads with Hedgehog Mushrooms. H was a tad concerned about the Sweetbreads since the last time she had them, it was texturally unpleasant. These were prepared differently. They were fried Crisp. They thoroughly enjoyed the Veal and H like the Sweetbreads but D ate the lion's share. My Salad was delicate and full of flavour. It was a winfall that I love Beets! Our fourth dish were separate as well. 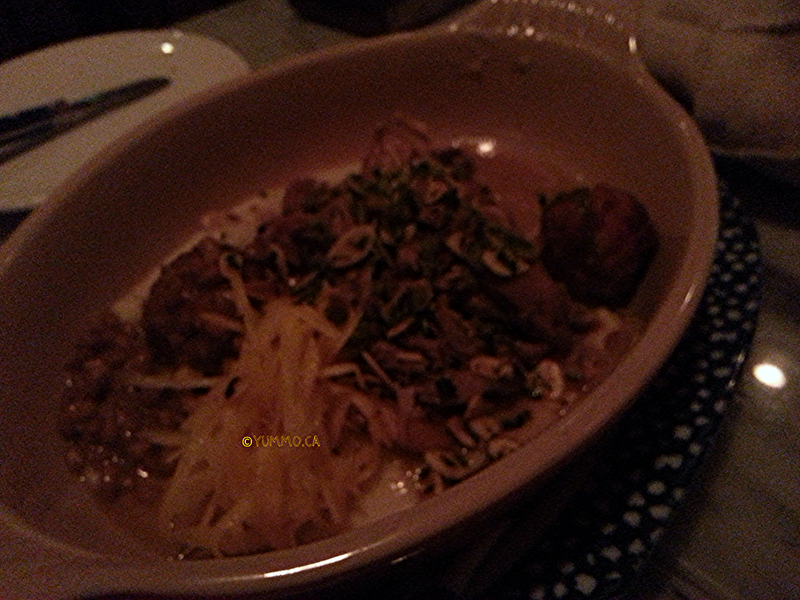 D and H had Goat with Meatballs on Celeriac Puree. 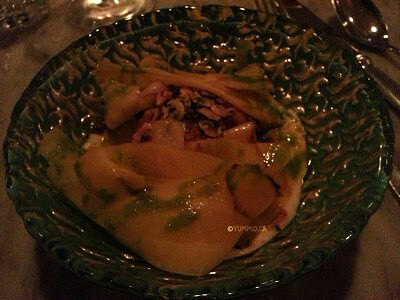 I had Morrocan Halibut Cheeks over Celeriac Puree with Shaved Carrots. The Halibut was very well seasoned and flavourful. It was a touch over done but it was on that Celeriac Puree, I forgive anything :). The Goat was very very mild and perfectly cooked. The Meatballs were savoury and comforting. D scraped the terrine clean. 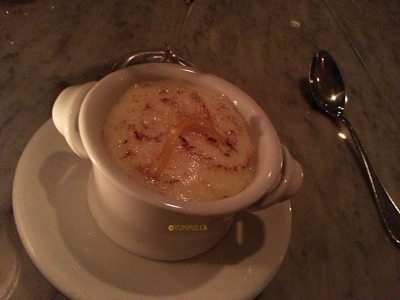 Our dessert was an AMAZING take on Crema Catalana, or Spanish Creme Brulee was how she described it. I would say it is nothing like a Crema Catalana, which I find cloying and pudding like. This was in a classification in itself. I had a whisper of a Sugar Crust on top. You couldn't feel it with a tap of the spoon nor seen the caramel but when you scooped it up, you could have that paper thing Sugary glass. The Cream itself was nicely perfumed with Orange and was a very strange sensation of Foamy Mousse. I say strange because it was so light it felt more like Cappucino foam but it did not feel like it lacked substance. It had a Blood Orange jelly on the bottom with bits of Blood Orange. I will searched the depths of the internet to try to replicate this dessert it was SOOOOO GOOD! We had a nice Barbera D'Alba, Fennochio 2011 which did not conflict with anything we ate. It wasn't ideal for the Tuna but it didn't clash. Family friendly: Not at all. Perhaps for brunch but not for dinner.